Monastery Simonopetr is dedicated to the Nativity of Christ. 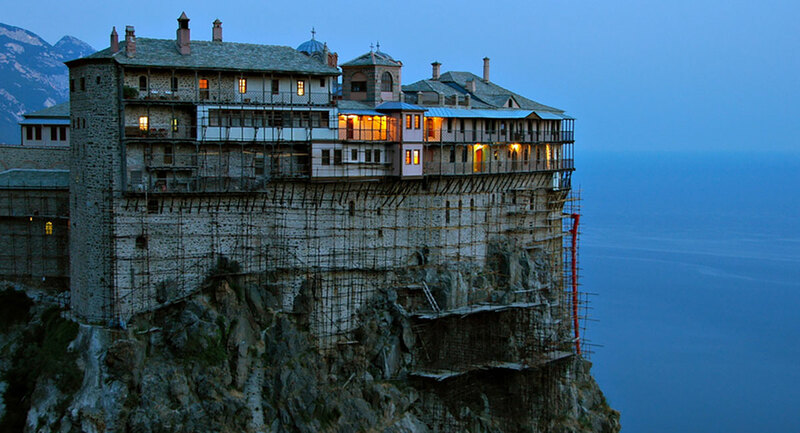 It is located in the south-western part of the peninsula, between the monasteries of Daphni and Grigoriat. He towers seven-story bulk over the sea and seems to float in the air. 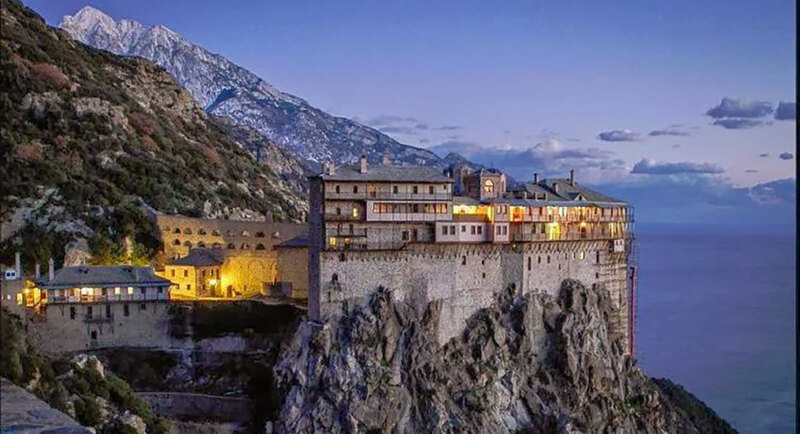 The monastery was founded by Saint Simon, Athonite monk of the XIII century, he called his creation “New Bethlehem”. Saint Simon, living as a hermit in these places, for two years saw an unusually bright star above the edge of the rock. The star then shone, then disappeared, and he felt that in this way the Lord kinged it over him to build a monastery on this place. Simon’s holiness was known to everyone, so many monks voluntarily speaked to work with him. The building began, and as it progressed to the edge of the rock, for the brethren became increasingly difficult to suffer such a dizzy altitude. They had to stop work. Once Saint Simon asked his cell-mate Isaiah to deliver the wine to the workers, but he stumbled and fell down from the cliff. Saint Simon called to the Theotokos and, grieving, asked the brethren to come down and bring the body of their faithful assistant. Imagine their surprise when Isaiah returned alive and unharmed, without even spilling wine from the jug! This wonderful event inspired workers, and they successfully completed the construction. Since then, this place is called “Simonopetr” (which means “Simon’s Stone”), in memory of the founder’s firm faith. In 1988, the Mother of God visited the monastery again with His mercy. The monks almost ran out of oil, and now, after the All-night Feast of the Presentation into the Temple of the Blessed Virgin Mary, they suddenly discovered that the vessels with oil had miraculously filled. In 1762 the Monk Paisii (Velichkovsky) arrived in Simonopetra with the intention to live here for a while. He had to leave soon, because of the inability to pay taxes to the Turks, but later he, using his influence, helped the monastery to raise its status. 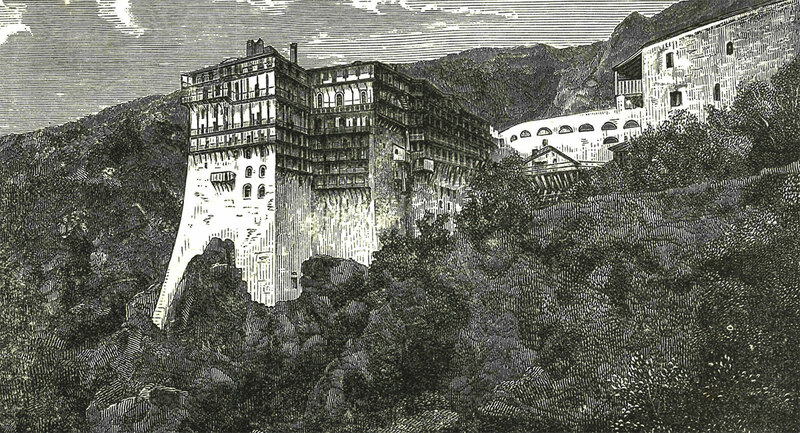 During the War of Greece for Independence (1821) Simonopetra was almost completely abandoned, like many other Athonite monasteries – most of the inhabitants left these places to not serve the Turks on the chance of forced mobilization. In 1891, a terrible fire broke out in the monastery, destroying everything. Including the cathedral and the library. The brotheren managed to escape and carry away the shrines. The monastery was restored to donations from Russia. Among the shrines of the monastery are fragments of the true Cross of the Lord, the left hand of the Holy Mary Magdalene, the foot of St. Kirik, the right hand of St. Dionysius the Areopagitis, the face of St. Sergius, the relics of John the Baptist, St. Great Martyr Panteleimon, the martyr Varvara, the head of St. Paul the Confessor and many other saints. The monastery is inhabited by 60 monks.